The InkJoy’s first impression did not disappoint. This particular pen, the body was this translucent black. It was sleek, with a great grip. The imprint was a stunning silver. A silver imprint on a black pen? There is nothing classier. I have two really important criteria for pens. The first is the weight. It can’t be too light and it has to own it’s spot in your hand. The second criteria is the ink. “InkJoy” says it all. Writing with this pen is a dream. Not only does the ink flow nicely, but you can match the ink to the colour of the barrel. Purple ink in the purple pen. Orange ink in the orange pen…etc! 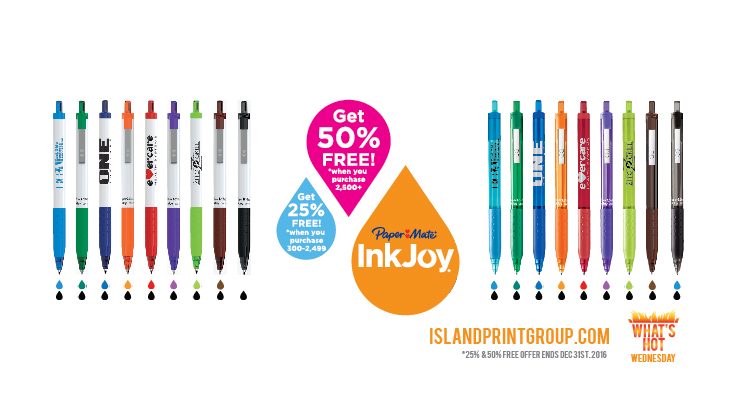 I hear you over there saying “Every coloured pen I’ve ever used has been horrible in one way or another.” To that I say: HAVE YOU USED THE INKJOY PEN!? The purple Inkjoy is my favorite. I write with that pen more often than any other pen in my pen cup. As you can see from the image above, there are plenty of colours to choose from! This pen is also VERY reasonably priced. You’ll be surprised. 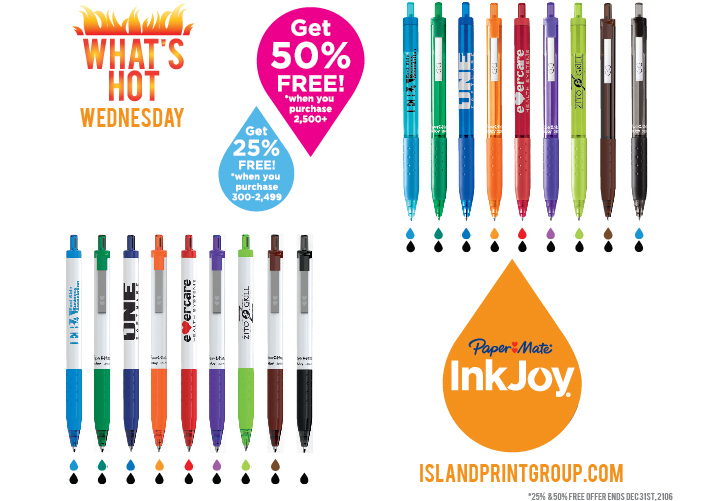 Not only that: YOU CAN GET FREE* PENS RIGHT NOW! Be sure to subscribe to our monthly (yes, only once a month, I promise) newsletter. I never knew how different pens could be. I had always grown up with giant boxes of standard pens and they always seemed to do their job. One day when I was at an office store I decided to get a nice pen. I was shocked to feel how smooth it was. Using other pens was definitely different after getting a nice one.